Koya-san is the headquarters of the Shingon school of Esoteric Buddhism, so you wouldn’t expect to see an armed hold-up on main street but I did. See it that is, not expect it. We turned a corner and found two guys in crash-helmets with serious looking handguns crouching behind a minivan while two guys in suits stood around watching. Since they didn’t shoot me for seeing their faces I figured it was a joke, or at least just a drill, and walked right by them then took up a spot along the street to watch. Soon they stormed across the road shouting as they entered a business there and one of the suits held up a sign, probably saying “Call the police and the bunny gets it!”. 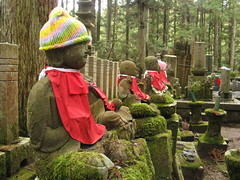 Any Buddhist worth their salt in Japan has had their remains, or just a lock or two of hair, interred in this cemetery-temple to ensure pole position when Miroku Buddha comes to earth. 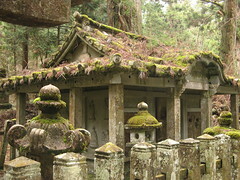 The cemetery is old and moss covered. 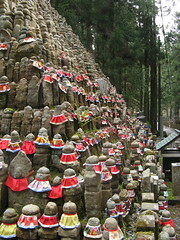 Huge pine trees grow between the mixture of graves, shrines and Buddha statues that get given knitted hats and coloured bibs by devotees. At exactly mid-day the weirdest thing happened. Hidden speakers played a minute or two of ambient music, then it faded away into the silence of a damp wooded cemetery again. 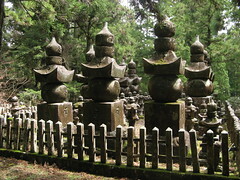 At the far end of the cemetery is the Toro-do (Lantern Hall) where photographs are forbidden. Not that my camera could capture the darkness of the room and hundreds of (presumably electric) lanterns on shelves and hanging from the ceiling. It implied silence and it was so until a tour group arrived and was instructed how to write on prayer sticks and donate into the money box. Around the back is the mausoleum of Kobo Dashi, the guy who devised the 88 temple pilgrimage on Shikoku and the main reason I knew about Koya-san. True believers say he is just meditating and will awaken with great insight soon. Nearby is Miroku-ishi. A large boulder (as big as a soccer ball but mushed around a bit) sits in a booth and pilgrims (and tourists) reach inside to put it on a shelf. Apparently it changes to the weight of your sins. Luckily I was able to lift it onto the shelf. But only just. Then there was the armed robbery, then several hours of busses and now I’m back at the hostel and amongst my room mates is a guy who’s been camping and hitching across the country for a month. I like him. Plus a guy who asked how much this tablet is worth, and what camera I’m carrying. I’m wary of him. Did you stay around to see what happened next? You are probably key witnesses.